There’s no shortage of new online casinos clamoring for your business. While some are slick and enticing on the surface, it’s only after depositing that you realized you’re stuck in a nightmare trying to get your winnings off the site. These are the casinos you want to avoid, which is why our reviews come in handy. 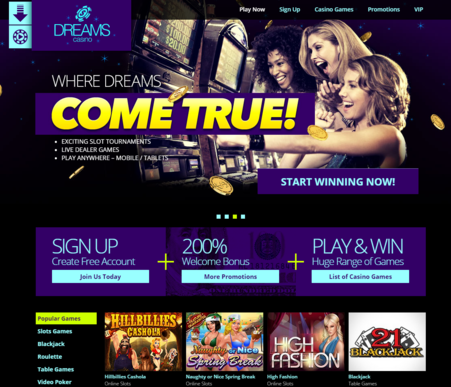 So where does Dreams Casino, a relatively new online casino launched in February 2015, fit in? Thankfully, they live up to their name. Our review has all the important information you want to know. Dreams Casino is certified by CDS, so you can ensure that everything is fair and honest. The software includes a high-end Random Number Generator, which randomizes every shuffle, every spin, and every deal online. All transactions are encrypted, so your personal information stays safe and you don’t have to worry about your financial details falling into the wrong hands. The site is consistently audited by third parties, so you can be sure that everything remains safe and secure. You’ve probably seen a lot of online casino welcome bonuses. They really aren’t anything new. 100% deposit bonuses are pretty much the norm. On occasion, you’ll see a 150% bonus. DreamsCasino.com outdoes a lot of them with a 200% deposit bonus worth up to $2,000. It’s impressive, but it’s not what makes the casino stand out the most. Dreams Casino also gives you 25 free spins on Builder Beaver. That’s in addition to the 200% bonus. It’s a great incentive to test out one of their more popular games. We can definitely see why they want you to try this game. We’ll warn you. It’s hard to pull yourself away from that one. We quite like the smooth animations and fun graphics found in the Dreams Casino games. As far as table games go, they are realistic without feeling to cluttered and overwhelming. That’s the case with games like blackjack, baccarat, roulette, and other popular games. The slots are much the same as what you’d find at a Las Vegas casino. Graphics are never realistic live and they certainly aren’t the case online. But they’re fun and familiar if you’ve ever played them at a land-based casino. Our favorite part is that the graphics carry over to your mobile device. Many online casinos offer a smartphone app that fails to port the popular games over to the small screen. While Dreams Casino’s mobile version doesn’t contain every slot game, the mobile games that are offered look, sound and play the same as their desktop counterpart. If you’re tired of the nightmare that is making a deposit to an online casino, you’re in luck. Dreams Casino accepts Visa, MasterCard, American Express, prepaid cards, Neteller, bank transfers, and even person-2-person transfers. Whatever method you prefer, you’ll find that funding your online casino account is relatively hassle-free. In our tests, we found that some banks do block online gambling transactions, so you might have success with one credit card but find difficulty with another. What’s more, after seeing our transaction declined by our credit card company, we gave them a call and told them to authorize the transaction. Some banks make you opt in to online gambling transactions so check before depositing. You can’t withdraw to your Visa, MasterCard or American Express, but getting paid is relatively easy no matter how you initially deposited. Withdrawal methods include Cash Deposits, Neteller, Check (Federal Express Cashier’s Check), Click2Pay or Wire Transfer. The first thing we do when we rate an online casino is look for CDS certification. With that seal of approval, we know that the software and site have been evaluated to ensure that they adhere to the same standards of openness and transparency that land-based casinos adhere to. DreamsCasino.com is certified by CDS, which means you can play knowing that the site is reputable and honest. Dreams Casino is licensed by Costa Rican government. The current company address headquarters are located in Costa Rica. Dreams Casino ticks all the boxes for what an online casino should be. Great games. Reputable software. A talented team behind it who cares about treating players the way they deserve to be treated. The only thing keeping Dreams Casino from a perfect 10/10 rating is the absence of live dealer casino. Management, however, tells us that a live dealer version is coming this year.